Healy Awards – Our 2015 Catalog Is Here! 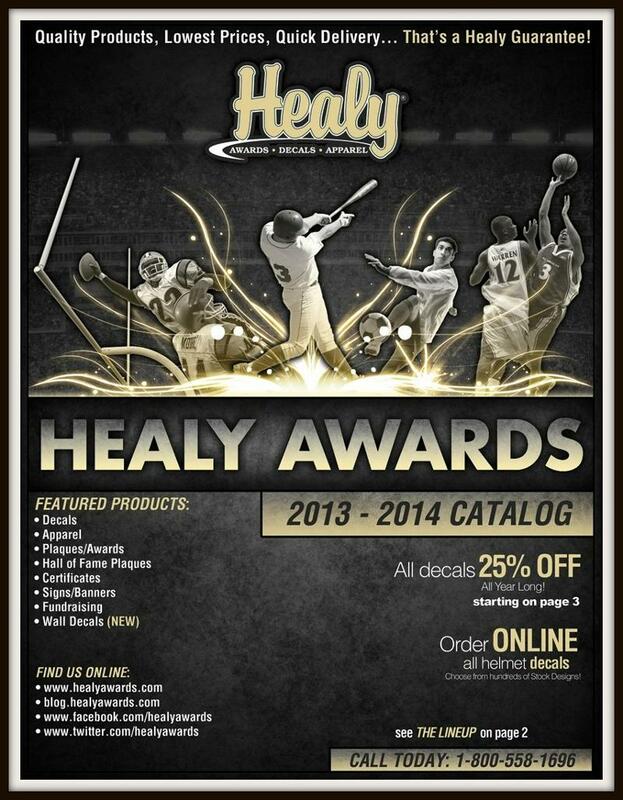 Introducing the 2013 -2014 Healy Awards Catalog. Visit the link below to view a digital copy of the catalog. Change the look of your helmets today! Call and order your Chrome helmet decals with Healy Awards! Available for football, baseball, softball, hockey and lacrosse. 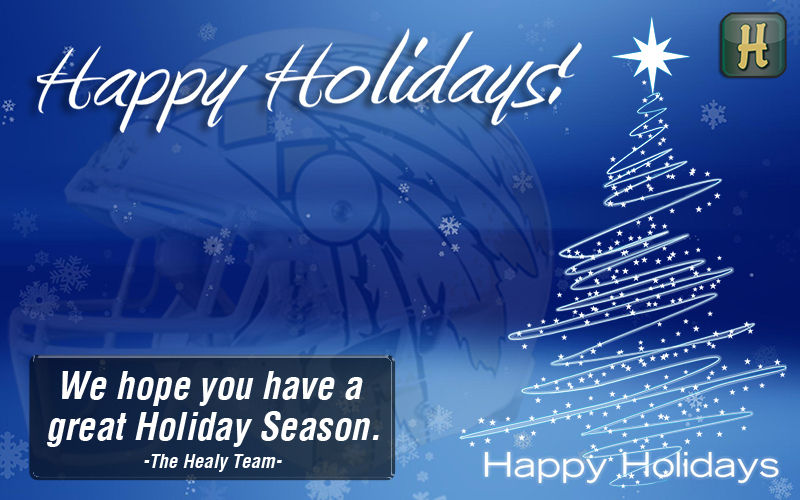 Call us at 800-558-1696 or email us at sales@healyawards.com. I just wanted to show you how the design looked on one of my helmets! Everybody loves it. Give us a call to help us design a Custom decal for your helmets. It’s never too late to order. Healy Awards provides youth teams to universities with decals for football, hockey, lacrosse, baseball and softball. We’re here to help you change the look of your team. Call 800-558-1696 or order online today! 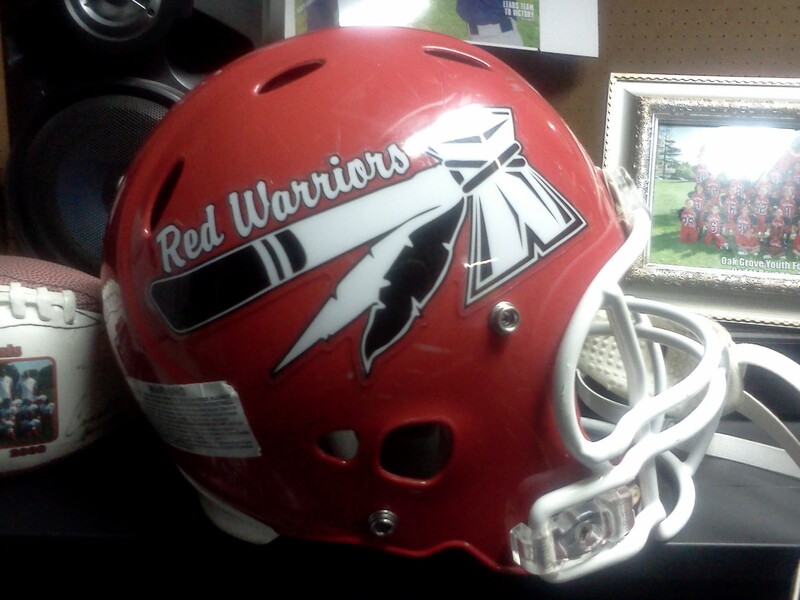 Utilize your helmet color in your decal design. We recommend keeping areas of your decal design clear in order to save money by having one less print color. This will allow your 2 color design to become a 1 color design. Additionally, this ensures that the color of your helmet is exactly the same as the color in your decals. Simplify your logo to 1 or 2 print colors. The best way to save money on decals is to simplify your logo utilizing only 1 or 2 print colors. Let our art department take your logo and make it into a stunning, affordable design today. Keep your decal size under 36 square inches. Our durable 20 mil vinyl custom helmet decals include any designs that are 36 square inches or smaller. Customers often want to create an oversized design to wrap their helmets, but at the same time save money. While we offer the lowest prices in the industry, decals that are over 36 square inches are significantly more expensive and more difficult to apply to helmets. Purchase greater quantities. The easiest way to save money on your decals is to purchase greater quantities of your team or organization’s decal. Take advantage of price breaks at 50 pairs, 75 pairs, 100 pairs, 150 pairs and 250+ pairs. Anticipate next year’s needs or buy extra decals to sell as fundraising decals. Order early to save on shipping. Don’t wait until the last minute to order your football helmet decals. By ordering early, we can create your decals in our standard production time of 2-3 business days and ship them to you UPS Ground. Too many customers wait until the last minute to order decals for their game two days later, and as a result, are forced to ship their decals UPS 2nd Day Air or UPS Next Day Air. This can prove to be costly. While we try to make all arrangements to shuffle our production schedule around to get your decals out as fast as we can, sometimes the problem is with how fast UPS can deliver them to your door step requiring you to use an expedited shipping method. Save 25% on helmet decals and decal accessories. Take advantage of our all year discount and low prices. 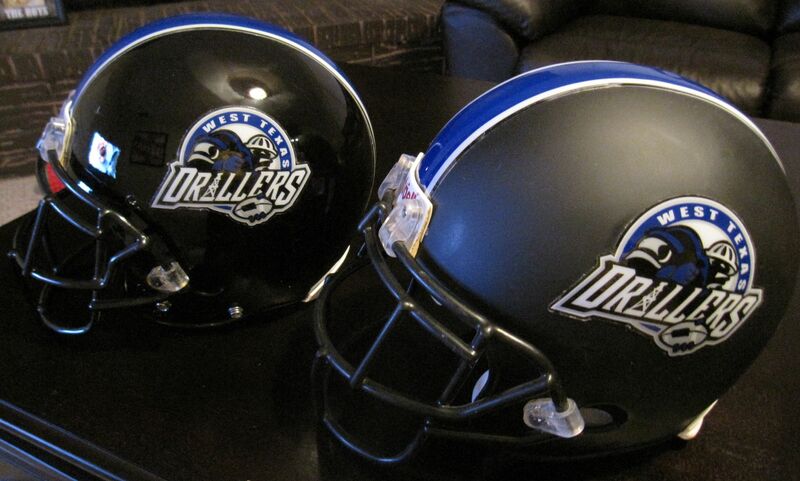 Save big on the Nation’s Toughest Most Durable Football Helmet Decals! We are proud to announce the launch of our new website at www.healyawards.com, which now allows you to order your decal and sticker products online. Available for online ordering are football helmet decals, baseball helmet decals, hockey helmet decals, lacrosse helmet decals, hard hat decals and all our other sticker products. Plus, check out our stock helmet decal, stock award marker and stripes football sections to see our newly released preview tool that allows you to preview your design before ordering. Simply select your helmet color and team colors to create a winning design for the upcoming season. It’s that easy! 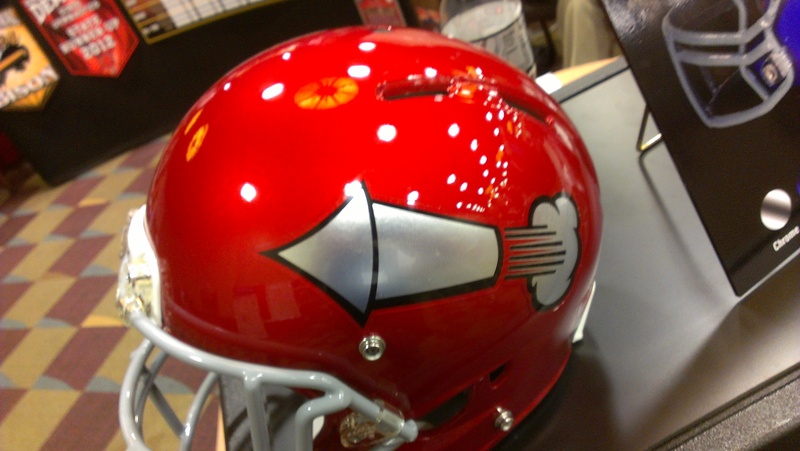 And remember, we offer The Nation’s Toughest Most Durable Helmet Decals! 25% Off Decal Purchases All Year Long. So what are you waiting for? Order online today! 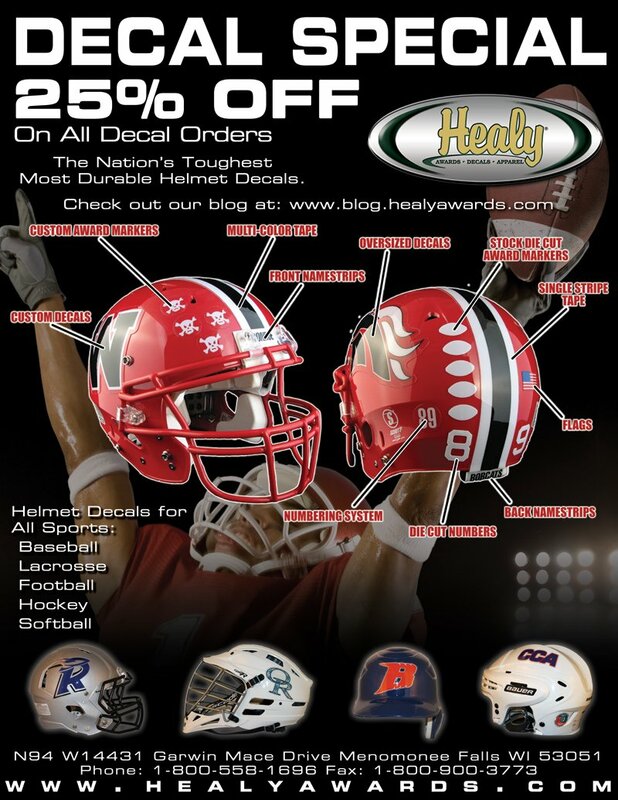 Healy Awards is currently offering 25% Off ALL decals & decal accessories for the 2012 year. This applies to all sports including Football, Baseball, Softball, Hockey and Lacrosse. Call our Customer Service Team today at 800-558-1696 to place your decal order for the 2012 season.